YOU NEED TO KNOW DANIEL LEVIN. Daniel Levin has been on the rise since his Don't Go It Alone debut in 2003. And while there have been plenty before him that has set the groundwork for the cello as a major instrument in jazz, inlcuding: Eric Friedlander, Daniel Pezzotti, Hank Roberts, and David Darling among others, Daniel Levin is one artist who is quickly making the cello a prominent force in jazz composition. With a presence that may be larger in Europe than in the states, those within jazz circles know what an amazing musician/composer he is. He has worked across the improvisational spectrum, with the likes of Ken Vandermark, Joe Morris, Andrew Cyrille, Anthony Braxton and many more. Levin brings a subtle adventurous beauty to this chamber setting on his latest, Organic Modernism (Clean Feed Records). His consist and always remarkable quartet of Wooley (trumpet), Moran (vibraphone) and Bitebc (bass) deliver an eloquent and colourful performance throughout the brilliant journey that is Organic Modernism. "My Kind Of Poetry" is as touching as it is melodic and dense in a slow blues-like fashion. The interaction between Bitebc and Levin at times feels like one instrument. The piece continues builds slowly with the addition of Wooley and then Moran in a more laid back role on this piece. Then we finally arrive at what is an interesting and brief denouement as Levin and Bitebc briskly break in and bring the piece to its conclusion. "Old School" begins with a haunting, swirling vibe started by Moran and Wooley and then intersects with Bitebc downward strumming and some intricate chord changes by Levin. It's an exploratory piece with a great deal of depth. Levin uses the space between perfectly and he and Moran interweave back and forth in the mix. There's a cool warmth to this meditative piece that gives you a realm glimpse of a quartet that has worked together for a very long time and knows how and when to fill the sound world they have created. "Wild Kingdom" is a wonderful statement which Levin unveils a fierce opening while painting the outside borders for the group to follow. There's improvisation here, especially from Wooley and Bitebc, but there is also a real sense of direction and structure that you soon grasp a follow with interest on how this end. That's the excitement of the organic journey. 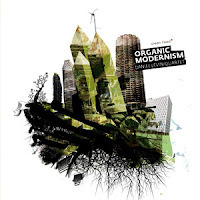 Organic Modernism delivers on the idea that the use of space, depth and sound can conjure some beautiful melodies. Organic Modernism also delivers the melody in unexpected structures, all the while, creating a pleasant listening experience for the audience. I hope for most people this isn't your first experience with Daniel Levin but if it is it is a great one. Now go buy the rest of his works.